Double your pleasure, with the E-102 which has a dual multi Dichroic moonflower effects in one. 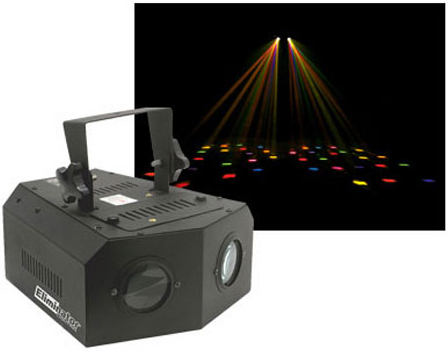 In sound active mode, dual beams rotate back and forth to the beat of the music. The beams are powered by 2 x 120v 200w (EL-200) lamps, which lowers your power consumption and give you bright crisp beams. Dimensions: 9"H x 11"W x 12"D.